Apple today announced iPhone 8, iPhone 8 Plus and a $1000 iPhone X today, the 10th anniversary of the first iPhone launch, at its new Spaceship-shaped headquarter in Silicon Valley. iOS 11operating system is also being launched along with the new hardware to support many advanced new features for face identification, wireless charging and augmented reality (AR). In addition, the OS 11 will include nastaleeq font that is popular with Urdu publishers in Pakistan, according to Silicon Valley based Urdu lover and Nastaliq campaigner Mudassir Azeemi. Apple did include nastaliq font in iOS 9 Beta 1 after a persistent campaign by Mudassir Azeemi. Unfortunately, it was later dropped in the released version of iOS X. But Mudassir continued his efforts which appear to have born fruit with iOS 11 being released this month. Apple will now drop naskh and support only nastaliq in native mode for rendering Arabic, Persian and Urdu languages. "Looking at the (rendering of the two fonts), the discerning eye may immediately realize why naskh trumps nastaliq on digital devices. With its straightness and angularity, naskh is simply easier to code, because unlike nastaliq, it doesn’t move vertically and doesn’t have dots adhering to a strict pattern. And we all know how techies opt for functionality. Utility being the mother of expansion, naskh is quickly phasing out nastaliq on the web. BBC-Urdu and Urdu Voice of America both use naskh; so does Alarabiya Urdu. And if you want to write an SMS in nastaliq, you must use naskh as well. 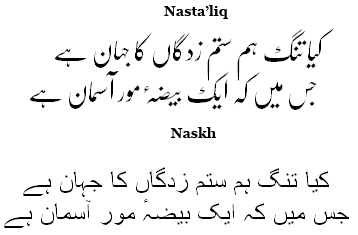 Same holds true for social media: Facebook, naskh; Twitter, naskh; blogs, naskh." Nastaliq lovers like Pakistan's Jang Media Group and others have not given up on their preferred script. Instead of using naskh, they have resorted to using uploaded image files for publishing content on their websites. Unfortunately, none of the other operating systems support nastaliq in native mode yet. They all support naskh which is becoming the dominant font for Urdu along with Arabic and Persian. However, Mudassir Azeemi believes that Apple's decision to only support nastaliq in native mode will influence all operating system vendors and social media apps like twitter and Facebook to start using nastaliq as default for Urdu. Apple's decision to drop naskh and include nastaliq as the default font for Urdu, Arabic and Persian is likely to have a major impact on all operating systems and social media platforms. It's welcome news for Urdu lovers like Ali Eteraz and Mudassir Azeemi who have been deeply unhappy with what they describe as "the death of the Urdu script". Majumdar sahib: " Congratulations. That is the least that Apple can do for the people of Pakistan, given Pakistans contribution to the world of IT, you yourself having been personally responsible for the development of microprocessors (albeit for a rival, Intel) "
Thank you. Younger Pakistani techies like Mudassir Azeemi are now carrying the torch well. It seems the Arab users don't like nastaliq fonts. Several are complaining about it on Apple developer forum. They seem to prefer naskh. "Hi iOS 11 has been released and Arabic font is totally changed to the worst and already hated by a lot of users , so please back to the old Arabic font.Thank you"
I talked to Apple engineers and they said there is a setting which can be turned off for Arabic speakers to use the Euro Naskh font. I was seeing Arabic in Nastaleeq because my language is Urdu. Can Pakistan Economy Add 2 Million Jobs a Year?